If you already know the value of digestive enzymes, the next few paragraphs may be all you need to read. They quickly tell you about the best value in digestive enzyme supplements, and how to get it. If you don't yet understand the vital role enzymes play in the digestive system, and why they are so important to your health, skim these few paragraphs. You will then get a detailed explanation of digestion, and learn the reasons why digestive enzyme supplementation is vital for your health. While most food comparisons are based on weight, with enzymes, the most important measurement is the activity and potency of the enzyme. There's only one national standard for the evaluation of enzymes and it comes from the FCC, which is the Food Chemical Codex. Some companies making enzymes, to hide the actual activity level of their product, list measurements based on dosage, which can be more than one capsule, and other companies use weights such as milligrams, and a few make up their own abbreviations. If the enzyme product you're taking doesn't say HUT for protease, SKB for amylase and LU or FIP for lipase, you can’t tell its potency. Single ionic form minerals give additional energy to the enzymes which makes them much more effective. P-A-L Plus Enzymes’ combination of high enzymatic activity with ionic minerals makes it the most potent enzyme formulation on the market. Most of our daily diet is proteins, carbohydrates and fats. To really improve digestion, and clean up the blood, an enzyme formulation must have a generous amount of protease, amylase and lipase with high activity and high potency. 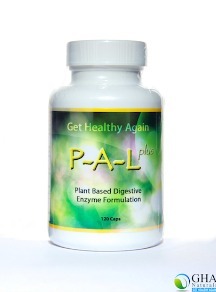 P-A-L Plus Enzymes has extremely large amounts of these all important enzymes. P-A-L Plus Enzymes is also the best value in enzyme supplements. Each 120 capsule bottle costs $49.95. If you look at the amount of protease and lipase in each capsule of P-A-L Plus Enzymes, and the number of capsules per bottle, there is not a better enzyme product for the money. Without taking digestive enzymes, you can't digest food properly, especially when the food is cooked. Because the enzymes in the food have been deactivated by heating. Even fresh fruits and vegetables, unless they are organically grown, are usually irradiated, which destroys the enzymes in them. This destruction of the enzymes in food causes or makes worse, virtually every digestive disorder there is. Gas, indigestion, acid reflux, you name it. It is an underlying cause of many different types of health problems throughout your body. As you will shortly learn. This happens because the human digestive system developed on a diet of raw foods containing active enzymes. Your body isn't equipped to handle a diet of mostly cooked food. It causes us to age quicker and fall ill more often. Low levels of enzymes are found in diabetes, heart disease and most every degenerative disease. And these low levels result from the lack of live digestive enzymes in your diet. When your food is poorly digested, you absorb nutrients that aren't fully broken down or usable. Which causes many problems. Because your immune system will attack and defend your body against partially digested foods that get into the bloodstream. The immune system doesn't recognize food, it sees a toxic invader and attacks it. When this happens, not only are you not getting the benefits of the food, but you are weakening your immune system by using it in a role it shouldn't be involved in. In other words, you are using the immune system and metabolic enzymes daily to clean the bloodstream of undigested food particles instead of having their full strength used to protect energize and repair your body. Dr. Howell was one of America's pioneering enzyme researchers and in his classic book "Enzyme Nutrition" he explains how the digestive system is designed to work. Before fire was discovered, man and animals alike could only eat raw food, like raw meat, plants or fruits and vegetables. He explained how raw foods have a 40/60 ratio of enzymes. Which means a raw food like an apple has live food enzymes within the apple which break down and digest 40 to 60 percent of that apple. Raw foods are enzymatically alive which means these foods have active enzymes within them to help digest 40 to 60% of that particular food. Since cooking destroys enzymes, cooked and processed foods are enzymatically dead which means there are no live enzymes within that food to help with digestion. These dead foods place a lot of stress on the digestive system, the pancreas, the immune system, the whole body. On top of this, we are already asking the human body to break down 100% of the cooked and processed foods and supplements we eat, and now, possibly 80% or more of the raw foods we eat. This stresses your body, every single day! Then, the food is swallowed and goes down the esophagus into the upper portion of the stomach. The food stays there for about 45 to 60 minutes to predigest. It will only be able to predigest if you are eating foods containing live enzymes because the body does not supply any enzymes at this stage of digestion. Then, the food goes into the lower part of the stomach where trypsin, pepsin and hydrochloric acid break it down further. Next, the food moves into the small intestines where the pancreas delivers digestive enzymes to complete the digestion process. Next, the nutrients pass through the intestinal wall and into the blood stream where metabolic enzymes utilize these nutrients in all parts of the body and in every living cell. The first way is in the pre digestive stage, which lasts approximately 45 to 60 minutes in the upper part of the stomach. Dr. Howell calls this the enzyme stomach because this is where the live enzymes within a raw food start pre digestion of that food. You can improve your digestion ability substantially by adding a digestive enzyme to break down the food as it sits in the upper stomach. This is very important because it will help to conserve your body’s enzyme supply. 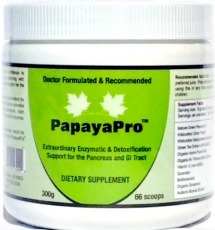 Lack of digestive enzymes affects the pancreas. Remember the digestive system is designed to break down approximately half of the food. When we eat cooked and processed foods, we're asking the digestive system to break down 100% of the food we've eaten. This means every time we eat these foods, the pancreas must produce twice as many enzymes as it is meant to and so it is working double time. Doing this year after year puts a tremendous strain on the pancreas. And eventually stresses our immune system and reduces our metabolic enzyme supply. When your enzyme supplies runs low, you become ill. There are three ways to conserve your enzyme supply so that it doesn’t run low. Eating organically grown raw food is one way. The second way is to take digestive enzymes every time you eat. The third way is to take digestive enzymes on an empty stomach. The faster your enzyme supply depletes, the faster you age and the more likely you will get disease. On the other hand, when you conserve and even increase your enzyme supplies, you increase the odds you'll live longer and healthier. Dr. Howell believed that the underlying cause of almost all degenerative disease is the depletion of the enzyme supply caused by eating mainly cooked foods. Dr. Howell said, "We know that decreased enzyme levels are found in a number of chronic ailments, such as allergies, skin disease and even serious diseases like diabetes and other severe diseases." Thus, if your enzyme supply is low, you'll have problems. But, if your enzyme supply is high, you'll be less likely to have these issues. Some problems show up in the long term while others show up in the short term. The cold and flu season is a very good example of problems showing up in the short term. During the months of November, December and January more colds and flu are reported than the other nine months combined. We have many holidays... Halloween, Thanksgiving, Christmas and New Years. During this time most of us eat a tremendous amount of cooked and processed foods, additional sweets, alcohol, pies, cakes which puts an extra burden on your body because your white blood cells must clean up more undigested food in the bloodstream. This is caused by the increased consumption of cooked and processed food which lowers the effectiveness of the immune system so we catch a cold or get the flu. Fat, in its raw form, is the best source of pure energy. But, when fat is cooked or processed, it no longer has the 40/60 ratio and quite often gets stored in the body... and is a reason why many people are overweight. Dr. Howell's research has also shown that a diet of cooked foods causes rapid, premature death in mice. In fact, rats on a cooked and processed food diet live about two years. While the rats that eat raw food live about three years. The rats eating raw food live 50% longer. Dr. Howell also noted that the brain weight of rats eating cooked food went down and their body weight went up. Another study took two groups of hogs. The first group ate cooked potatoes and gained weight rapidly. While the second group ate raw potatoes and didn't get fat. Dr. Howell believed, based on his work in a sanitarium, that "It is impossible to get people fat on raw foods... regardless of the caloric intake." At the Michael Reese Hospital in Chicago, experiments were done on two groups of people. The first group were individuals 21 to 31 years old. The second group were 69 to 100 years old. They found the younger people had 30 times more amylase in their saliva than the older people. This is why, when we're young, we can handle a diet of bread, pasta, pastries and cooked foods without much problem. But this type of diet can cause rapid aging and depletion of our enzyme supplies. Eskimos ate only raw fat and raw meat before they adopted our cooked diet. Because there were live enzymes within these foods, they lived a long and healthy life. Now that they are eating packaged, processed sugary foods, they have one of the highest rates of diabetes in the nation. In the colon, undigested proteins putrefy, undigested carbohydrates ferment and undigested fats turn rancid. This causes toxicity. These toxins can seep through the intestinal wall and get into the blood stream, which can lead to even more health problems. When you eat cooked and processed foods, the pituitary, thyroid and pancreas all must donate enzymes to help digest that food. This slows your bodies metabolism and weight will probably be gained. Obese people have very low levels of lipase in their body and lipase is the enzyme necessary for breaking down fat. When digestion is bad, the body craves more energy and some people eat and eat to try to satisfy that hunger. The food they're eating isn't being fully broken down and digested and the nutrients within the food aren't being released and delivered to the cells to satisfy the hunger. If fat is not properly digested, it can cause many cardiovascular problems among other things. I hope you're starting to understand that the human body must have its food and supplements in their correct forms so that every one of the trillions of cells in the human body can benefit from those nutrients. What we can do to turn this totally negative situation into a positive one is to start taking an exceptional digestive enzyme with our food and even between meals. This fact would indicate that the immune system is trying to get rid of incompletely digested food. According to Dr. Paul Kautchakoff, the major cause of leukocytosis (a raised white blood cell count) is eating cooked foods. Dr. Kautchakoff divided his findings into four classifications. 1st - Eating Raw foods produced no increase in the white blood cell count. 2nd - Eating commonly cooked food caused leukocytosis. 3rd - Pressure cooked food caused even greater leukocytosis. 4th - Man-made, processed and refined foods, such as carbonated beverages, alcohol, vinegar, white sugar, flour and other foods, caused severe leukocytosis... and listen to this... eating cooked, smoked and salted meats brought on violent leukocytosis consistent with ingesting poison. Every single day our body reacts this severely to cooked and processed foods and we abuse our body's protective repair systems by getting them involved in digestion. You can take all the immune enhancers or immune boosters you want but how much can they possibly help? Until this problem is corrected by supplementing with a good digestive enzyme product, the process will continue and wear down the body. P-A-L Plus Enzymes, when taken between meals or on an empty stomach will go directly into the blood stream and clean up the blood. This includes the fat and protein deposits left in the body from years of poor eating habits. Plaque buildup in the arteries is partially caused by undigested fats and undigested proteins that build up on the artery walls. If it builds up enough, you’ve developed clogged arteries. Taken on an empty stomach, P-A-L Plus Enzymes will help clean up the arteries by digesting the proteins and fats in the plaque. The main function of metabolic enzymes is to build, rejuvenate and repair the cells in your body. Metabolic enzymes also are capable of digesting nutrients that haven't been fully broken down to their smallest possible ionic size. Another important note; metabolic enzymes produce metabolic enzymes, which produce more metabolic enzymes, which produce more metabolic enzymes... This means we're directly affecting our bodies potential to repair itself. If you take P-A-L Plus Enzymes with your meals for one full year, you'd have plenty of metabolic enzymes in your body. Metabolic enzymes build, rejuvenate and repair the entire human body. Because the human body places a higher priority on digestion than it does on repair, you need to take P-A-L Plus Enzymes to make sure the metabolic enzymes don't divert their attention away from cell repair and cell reproduction. Research has shown that digestive enzymes are 2 to 3 times more active when they have a trace mineral complex with approximately 70 single ionic minerals. They also show that it is important to have protease with an HUT activity of 30,000 or more. Proteins are one of the hardest substances for the human body to digest, and at least 30,000 HUT of protease per capsule is needed to adequately digest proteins and clean up the blood stream. Clinical studies referenced in the book "Enzymes, The Fountains Of Life" show that a good enzyme formulation has the capability of increasing and elevating the immune system activity by as much as 700 to 1300 percent within one hour after ingesting. P-A-L Plus Enzymes isn’t just a good enzyme formulation, it's a great proteolytic formulation with an HUT activity of 60,000 Protease, an Acid Stable Protease of 100 SAPU and a Neutral Bacterial Protease of 40,000 PC per capsule. Most parasites, bacteria and fungi are made of protein and some viruses are covered by a protein film. Taking protease on an empty stomach can help digest and get rid of these pathogens in the bloodstream and spare the immune system from doing this job. Raw butter contains large amounts of lipase and in 1930's researchers found they could treat psoriasis by having their patients eat large portions of butter to get the benefits of the lipase. Lipase breaks down fat and many people that gain weight easily are low on lipase. The 12,000 LU or FIP of lipase and 6,000 of Pancreatin in this formulation will help a lot of people with digestion, clean up the blood and improve weight problems. Lipase can also digest the cell wall of some viruses... composed of cells surrounded by fat. Another major benefit is that lipase that isn't used up in the role of digestion can be stored in the liver for future use and thus replenish the lipase supply in our body. A very interesting note about lipase is that it will take about 500 LU of lipase will break down about 4 grams of fat. This isn't a very large amount of fat. P-A-L Plus Enzymes has 12,000 LU or FIP of lipase which is enough to help break down about 96 grams of fat. So, if you're in a hurry and you have to stop and eat a whopper and fries, which has about 60 grams of fat... a capsule of P-A-L Plus Enzymes will easily help digest that meal and this is how you turn bad undigested fat into less of a problem because it's been fully digested. Dr. Howell felt that the biggest problem in human health started when man discovered fire and changed the nature of our food which helped to create enzyme deficiencies. More than 25 million people in Europe and Japan have been given enzyme supplementation or therapy with enormous success... all with no side effects. Enzymes are food... not drugs! Enzymes are a key piece in the puzzle of life because they make the other pieces work. Enzymes are the very life force that activates vitamins, minerals, proteins and other physical components within our body. Vitamins, minerals, proteins or hormones can't do their work without enzymes. Enzymes are the most important supplement you can give your body. Vitamins do not deliver energy by themselves, they require enzymes for energy. Enzymes unlock the energy in food and make it possible for the human body to function properly. It's been clinically proven... the more enzymes you take, the quicker your body can restore, repair and strengthen itself. If you take P-A-L Plus Enzymes with your meals and on an empty stomach, you’re going to help your immune system build, rejuvenate and repair the entire human body. You’ll give the metabolic enzymes time to reproduce and create more metabolic enzymes This alone can improve your health and strength. Take P-A-L Plus Enzymes, and improved digestion will be experienced. Energy levels can improve, vitality can be restored, and health problems may even disappear. If you truly value your health... you need P-A-L Plus Enzymes with meals and on an empty stomach too. A 120-capsule bottle (which is a month supply) is only $49.95. It's the best $49.95 monthly investment that you can give your body. There is no doubt, enzymes are at least, if not more important than any vitamins, minerals or any other nutrient, because enzymes are the work force and life-force of the human body. If you want to build a strong healthy body, continue to supplement with vitamins, minerals and other nutrients that are good for you. When you add P-A-L Plus Enzymes, your vitamins will work better, your minerals will work better and you'll get more out of the food you eat. Unless you’ve been eating a raw food diet your whole life, your body doesn't need a little help... it needs a lot of help. If you try the P-A-L Plus Enzymes, you will notice a difference. The main ingredient in this formula is mature green papaya powder. Papain is the principal and most active enzyme in this powder. Papain possesses a very powerful digestive action superior to pancreatin, or pancreatic enzymes. Changes in intestinal alkalinity or acidity do not interfere with the unique digestive activity of papain. Taken on an empty stomach, it will work more aggressively than even the pancreatic enzymes in finding and digesting unwanted cells. Taken with a meal, it will also help digestion of your food. Papain, one of the most powerful plant proteolytic enzymes, will aid in protein digestion in an acid, alkaline or neutral medium. This is of vital importance if you are enzyme deficient or have low hydrochloric acid output in the stomach. The pepsin produced in the stomach for protein digestion is activated only in an acid medium. This requires a healthy output of hydrochloric acid which is insufficient in most people. Due to the powerful proteolytic action of papain, a more active digestant than pepsin, a major digestive problem for most people will be helped by the daily ingestion of mature green papaya powder. The second important ingredient in PapayaPro is Citrus Pectin. Citrus Pectin has the potential to prevent the spread of unwanted cells. Modified citrus pectin’s small molecules enter the bloodstream and act as decoys for lectins (unwanted cell surface proteins), which are seeking the sugar galactose in cells. When lectins encounter the pectin, which also contains galactose, they attach to it as they would to a cell. Once bound to the pectin, lectins are unable to attach to other sites in the body and start new cancer colonies. Thousands of research studies have demonstrated citrus pectin's very helpful abilities. PapayaPro also contains other immune boosting and important ingredients such as mangosteen powder that act synergistically with the papaya powder. Use one to two of the 300 gram containers monthly on an empty stomach to fight disease. Get an extra container if your digestion is poor and you want help breaking down protein. Papaya enzymes will, on an empty stomach, get into the bloodstream and work to clean it up. Most importantly, it will digest dead, unwanted cells that the body is killing off. This will take a big load off the detoxification system and help to reduce detox symptoms and inflammation at healing sites. One word of caution, Mature green papaya papain can reduce Progesterone and therefore, should never be used during pregnancy or if you are trying to become pregnant. Click here to learn about fighting cancer. Learn how enzymes help autism. Learn how enzymes help Crohn's disease. Learn about the benefits of enzymes for Fibromyalgia.